South West New Brunswick Transit Authority chair Stan Choptiany of St. Andrews NB (at right) receives the 2018 John Pearce Award from Michael Perry, a long-time member of Transport Action Atlantic’s board of directors. This year’s outstanding public transportation advocacy award recognizes Mr. Choptiany’s leadership in returning daily bus service to rural Charlotte County. The chair of the South West New Brunswick Transit Authority is the 2018 winner of Transport Action Atlantic’s John Pearce Award, recognizing outstanding contribution to public transportation advocacy in the region. Stan Choptiany was honoured at TAA’s annual general meeting, held in Moncton on May 5. The former mayor of St. Andrews was cited as someone who initially saw the need, was instrumental in establishing the transit authority, and then worked diligently as its chair, guiding it through the labyrinth of government funding sources while tirelessly maintaining contact with potential riders. “Stan has clearly demonstrated his belief in rural public transit as an essential public service,” said Michael Perry, a long-time member of TAA’s board of directors who presented the award on behalf of the advocacy group. 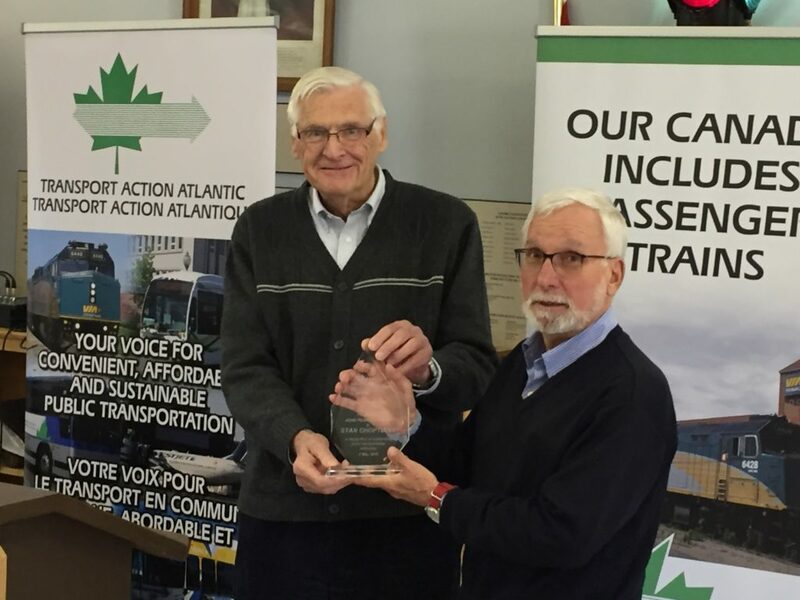 The John Pearce Award was created to honour Transport Action Atlantic’s president emeritus, who retired last year from active participation after 40 years of dedicated public transportation advocacy. It is awarded annually to an individual or group to recognize an outstanding contribution, consistent with Mr. Pearce’s life-long passion. TAA 2018 AGM – this Saturday!